CrackBerry, online at shop.crackberry.com, for the largest selection of BlackBerry accessories. CrackBerry offers cases, chargers, batteries, Bluetooth, car kits and mounts, headsets, cradles, screen protectors, styluses, memory cards, cables, and more for a range of BlackBerry mobile devices. CrackBerry carries top brands like iSkin, Ballistic, BlackBerry, Griffin, HTC, Mobi Products, SanDisk, Samsung, and many others. 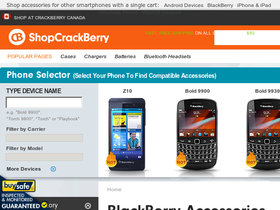 CrackBerry also offers their great selection at discounted prices. So before you shop, get all the best shop.crackberry.com discounts, CrackBerry promotions, and CrackBerry coupon codes found here at RetailSteal.com. CrackBerry ships within the United States, APO/FPO addresses, and international destinations via USPS or UPS. Some restrictions apply. See site for more information. Save up to 75% on a great selection of cases for BlackBerry from CrackBerry. Click link to shop and save on Mobi Products, Smartphone Experts, BlackBerry, and more. Get free shipping from CrackBerry with your purchase $50+. Offer applies to orders within the continental United States. Save up to 75% on the hot accessory deals happening now at CrackBerry. Click to shop. Save up to 75% on chargers and cables for BlackBerry mobile devices. Shop CrackBerry today and save. Save 60% on the BlackBerry JM-1 1230mAh standard battery from CrackBerry. Click link to shop. Save up to 25% or more on car kits and mounts from CrackBerry. Shop today and save on brands like iGrip, Arkon, Jabra, and more. Save 26% on the iGrip PerfektFit Charging Dock for BlackBerry Bold 9930 and 9900 from shop.crackberry.com. Click here to get started.